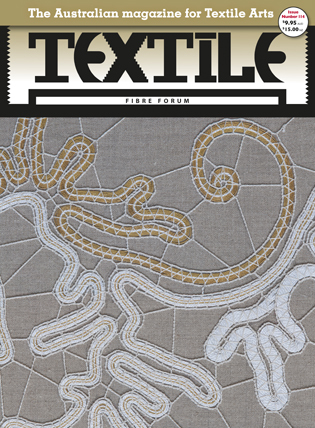 Textile Fibre Forum, an iconic textile art magazine, has been in print since the 1980s. It has been under the ArtWear Publications banner since late 2011. It is published each March, June, September and December. This issue published June 2014. Regular columnists in this issue include JANET DE BOER, MARIE-THERESE WISNIOWSKI, IAN PENROSE, INGA HUNTER, LIZ POWELL.